I kinda cheated and had my Tuesday Movie Night last night with Texas Killing Fields and the remake of Footloose, since all of the DVDs arrived a day early. 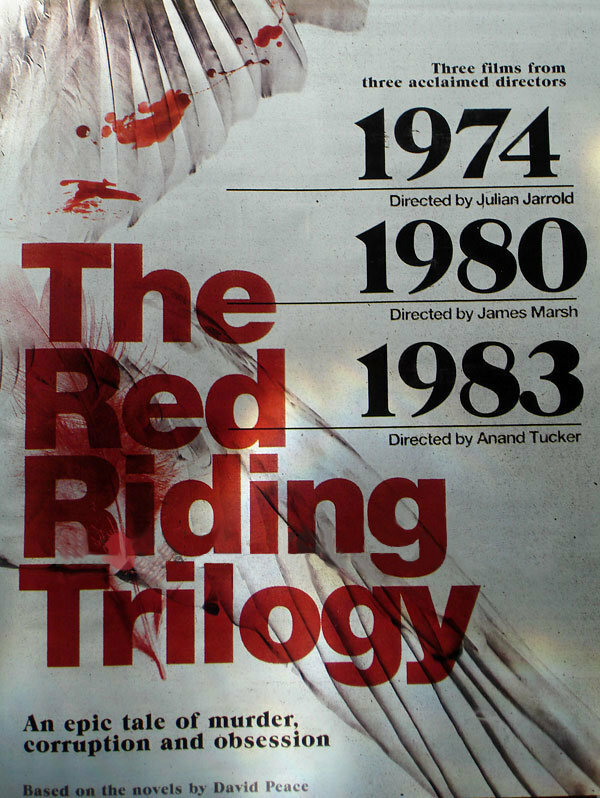 Tonight, though, I plan to watch the entire Red Riding trilogy since I got them from Fatso last week. My life is becoming overly British, of late. I've listened to the entire The Girl with the Dragon Tattoo soundtrack at least five times now (and hey, that is 15 hours of my life gone to the same album), so I've finally figured out what my favourite songs from it are - apart from Immigrant Song. My favourite of all the favourites is the final song, 'Is Your Love Strong Enough?' by How to Destroy Angels. Such an awesome song - and so fitting with the movie. ABOUT/BLOGROLL: This is where most of you are linked. It just looked a bit untidy in the sidebar, and I don't think it would have looked right. 1001: Where the movies from '1001 Movies You Must See Before You Die' are listed and where you'll find out what I've seen. MY FILM JOURNAL: Where the pages from my Moleskine Film Journal have been scanned in so you can have a look at it. This is like reading my diary, yo. I'm always happy to see bloggers who love The Girl with the Dragon Tattoo (Fincher's version) almost as much as I. Mette of Lime Reviews and Nikhat of Being Norma Jeane are now on the bandwagon. Filling up my RSS feed today were quite a few predictions for the Oscars from Never Too Early Movie Predictions. They look pretty spot on. Speaking of the Oscars, the LAMB Devours the Oscars is happening now, so check out the posts they have so far. I promise I'll write mine soon, just have to see A Cat in Paris and Kung Fu Panda 2! I heard whispers that Take Shelter is out on DVD here in March (eeeeeeeeeeeee!). Making me even more anticipated to see it is Sati @ Cinematic Corner, who raves about it. One movie I have seen, though, is The Muppets, which I loved. Ruth @ "...let's be splendid about this..." really liked it too. And how could you not? While The Artist may be getting all the buzz, I hope that some people remember Hugo, too. Tyler @ Southern Vision particularly liked it, a little more than I did. I still haven't found a way to go and see Tinker Tailor Soldier Spy over at the cinemas yet (I'll just wait for the DVD), but Mike's review of it over at Front Room Cinema doesn't make me feel so sad about that. However, if there is one film that I'm going to see in cinemas even if I have to walk fours to get there is The Artist, if it ever comes to Palmy. Andy at his Film Emporium saw it and despite being disappointed because of expectations, was quite enthused by it. In your honest opinion, what do you think of my new layout? I like the new layout. It's bigger and more organized. Thanks! I like the bigness of it. Thanks for the mention Stevee. Love the new look of the site (the 1001 Movies etc.) You have to see THE ARTIST right? Impossible to give it a negative review - and I'm sure i will adore it even more on a repeat viewing. Tonight I might check out Dragon Tattoo again haha. Thanks! And Dragon Tattoo again? Wish I could do that, haha. That movie's ace. Loving the new layout. Just bought me a Moleskine film journal off Fishpond so the second that gets here I'll be filling it out like crazy. Thanks for the linkage too, and the GWTDT music is freakin' awesome! Oooh, you can get them off Fishpond? When mine runs out I'll be buying one off there straight away. They really are great! And yes, the Dragon Tattoo music is amazing - even more than the movie! I know! Well, not really considering the stuff that happens in that movie. I could however imagine us in a little bandwagon wearing Lisbeth's t-shirt. Haha. First of all, thanks for the link!Second of all, I love your new layout and design, it's wonderful and the colors are great! Keep up the good work (you got me interested in the Red Riding trilogy)! Thanks! And watch the Red Riding trilogy - it is really good! Amazing layout this is one of the finest blogger designs I've seen in a while! 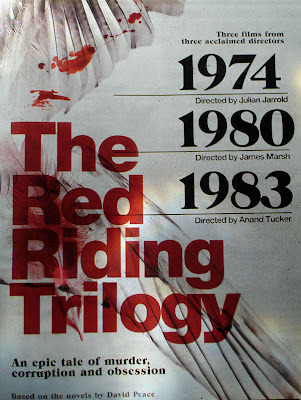 Ive had the red riding trilogy with me for the longest time and still I haven't seen it. I just have to sit down and watch it some day. I've only heard good things about it. Definitely watch it! It is such a good trilogy! Thanks for mentioning my review! I think you will really love the movie, Chastain is great in it. Going through my emails from this week and discovered this post from you. Thanks for the link love! So am I. I saw your post today - great stuff!